SITUATED ON THE OUTSKIRTS OF PHOKENG, 2 HOURS NORTH WEST OF JOHANNESBURG IN A NATURAL AMPHITHEATRE ON THE LOWER SLOPES OF THE MAGALIESBURG MOUNTAINS. 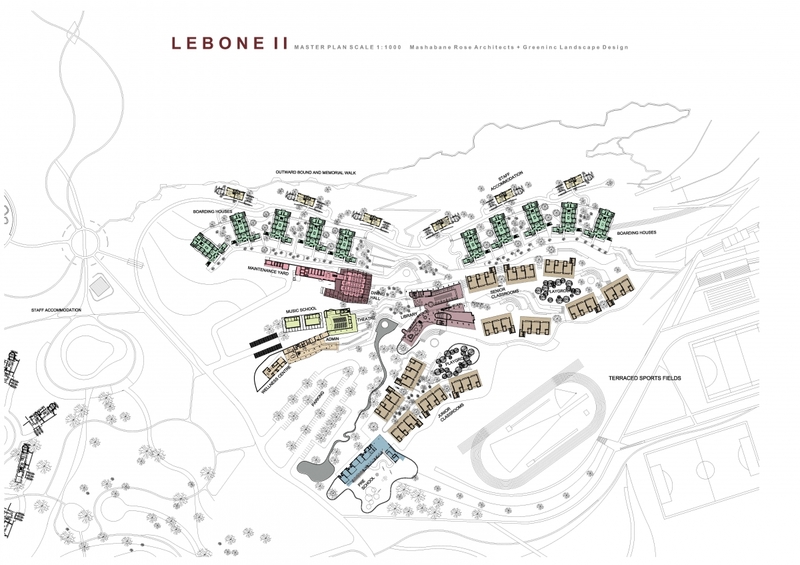 CONCEIVED AS A SERIES OF TERRACED PLATFORMS AND STREETS, THE SCHOOL HUGS THE HILLSIDE, AND IS SITUATED ON AREAS DAMAGED BY EXTENSIVE QUARRIES. THE LIBRARY, THEATRE AND DINING HALL FORM THE HEART OF THE SCHOOL, ARRANGED AROUND THE CENTRAL GATHERING COURT WHERE OUTDOOR ASSEMBLIES WOULD BE CONDUCTED. THE CLASSROOM BLOCKS ARE ARRANGED IN ASCENDING ORDER MOVING UP THE SLOPE WITH INCREASING AGE GROUPS WITH THE LIBRARY STREET FORMING THE TRANSITION FROM PRIMARY TO SENIOR. EMPHASIS IS GIVEN TO OUTDOOR TEACHING & PLAY SPACE AND THE ARCHITECTURE RESPONDS TO THE AFRICAN LANDSCAPE AND CLIMATE WITH CAREFUL CONSIDERATION.